The Thing’s Incredible! 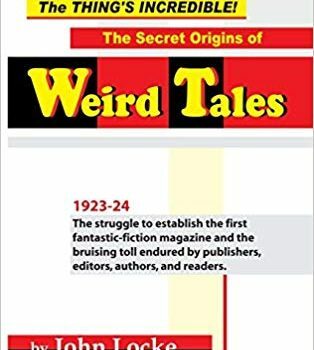 The Secret Origins of Weird Tales, John Locke (Off-Trail Publications 978-1-935031-25-3, $35.00, 314pp, hc) June 2018. We’re creeping up on the 100th anniversary of Weird Tales, the first issue of which was dated March 1923 but was available at newsstands the month before. It’s an event deserving of some fanfare. Although it struggled financially for the entirety of its almost 32-year existence – we’re talking the original Weird Tales here, not its later continuations – the magazine launched the writing careers of scores of fantastic fiction’s luminaries, among them H.P. Lovecraft, Clark Ashton Smith, Robert E. Howard, Robert Bloch, and Ray Brad­bury, to name but a few. It also wrestled the tale of the fantastic away from what had been until then primarily a British storytelling tradition and fostered new approaches to the weird consistent with those in the burgeoning American popular fiction market. The weird tale as it’s told today wouldn’t have been possible without the troubled success of Weird Tales. So much has been written about Weird Tales over the decades that it would seem there’s noth­ing new to tell about it. John Locke disproves this in The Thing’s Incredible! The Secret Origins of Weird Tales. His intensive look at the magazine’s founding late in 1922 through its tumultuous near-death in 1924, before it changed publishers and corrected course is a fascinating look at the dynamics that bound – or in many cases failed to bind – publishers, editors, writers, and readers together during the pulp magazine era. Much of what Locke writes about has been addressed glancingly in other accounts of the magazine, notably Robert Weinberg’s The Weird Tales Story (1977), but not to the extent of this book’s coverage. Culling market reports from trade magazines such as The Student Writer (later The Author & Journalist), published letters, and memoirs of key personnel, Locke meticulously constructs a rich and detailed context in which to view the magazine’s birth pangs and the problems, both financial and aesthetic, that dogged it for its first thirteen (lucky that!) issues. The book’s 235 pages of narrative text are annotated with 609 footnote citations. Their insights help to flesh out facts that key memoirists of the magazine hitherto mentioned only in passing, as well as to correct inaccuracies misremembered decades later, and to organize a proper chronology for the events of the magazine’s first two chaotic years. This isn’t a secret history so much as a more elaborate history than has been told before, bolstered by scholarly research, documentation, and some suppositions or surmises which seem to fit the facts. 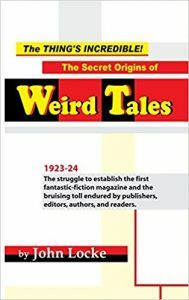 Weird Tales was the brainchild of Chicago-based Jacob Clark Henneberger, who at the time of its conception was the publisher of Col­lege Humor, a successor to his debt-ridden The Collegiate World whose fortunes he had turned around by shifting its focus to find a broader readership. His success in doing so may have persuaded him foolishly that he could do so with Weird Tales when its problems took it past the point of no return. With John Lansinger, an old school friend, Henneberger incorporated the Rural Publishing Company in 1922 to publish two magazines, Detective Tales and Weird Tales. The latter was inspired by Henneberger’s fond­ness for the fiction of Edgar Allan Poe and the lack in the marketplace of a magazine that would cater to readers with similar tastes. 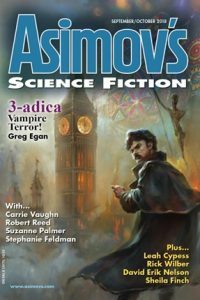 At the time, genre magazines were beginning to split off from general interest pulps, but whereas adventure, detective, and western magazines were taking off there was no specialized magazine to serve fans of fantastic fiction. (Science fiction wouldn’t get its due until Amazing Stories launched in 1926.) With the ambitions of an entrepreneur Henneberger sensed a new market to exploit. The two magazines would share an editor, Edwin Baird, and a handful of writers, but prob­lems were manifest virtually from the outset. Weird Tales was priced at 25 cents, another 10 to 15 cents more than many other pulps. By its third issue it changed format from pulp size to a larger bedsheet size with fewer pages than the first two issues – likely (already) a cost-saving measure. The change in format means it likely was grouped at newsstands with the larger-sized slick-paper magazines like the Saturday Evening Post (which sold for less) where, with its cheap pulp paper, tacky two- and three-color covers, and dubious content, it would have looked like a very poor relation. It skipped issues that August and the following January. Locke does a solid job of analyzing how these little glitches, seem­ingly inconsequential on the surface, add up to indicate a magazine floundering. Weird Tales‘s biggest problem, however, may have been its fiction. Although Baird chortled in his editorial broadsides that the “gooseflesh fiction” the Weird Tales published would have been “tabooed” in other magazines, the vast bulk of submissions he was seeing were ineptly written, typo-ridden, and unimaginative in approach to their themes. Baird admitted as much in his postings to trade journals. The title of his book is actually taken from a quote of his in an issue of The Story World and Pho­todramatist, where he describes in exasperation an office inundated with an unstemmed flood of unpublishable manuscripts. Part of the problem, as Locke shows, is Baird’s attitude towards those submitting. He openly professed not to care whether name writers sub­mitted, and the magazine’s payment practices – a cent or less per word upon publication, and usually a considerable interval after publica­tion – all but insured that name writers wouldn’t submit, and regular writers might wait to submit more work until the paychecks started coming in. Weird Tales‘s laggardly payment practices became so chronic that they were reported in the trades, virtually ensuring that writers of caliber would steer clear of it. What’s more, it was the magazine’s policy to list only a single story title or author’s name on the cover, if at all, and, as Locke notes, this was a misstep, since most pulps depended on readers buying them regularly to read the stories of their favorite writers, many of whose names were called out in cover lines on the monthly issues. Locke beefs up stories known to Weird Tales aficionados with new data and speculations: how Otis Adelbert Kline and Farnsworth Wright were hired as readers and how their own contributions to the magazine may have been influenced by what they read in the slush pile; how the magazine desperately enlisted the services of celebrity ma­gician Harry Houdini in early 1924 and fobbed off ghost-written stories as strange-but-true accounts of his personal adventures; how the magazine found, in H.P. Lovecraft, the north star by which it hoped to steer itself into its future, and how Henneberger offered Weird Tales‘s editorship to Lovecraft when the magazine was on the ropes; how Rural was dismantled after publication of the magazine’s 13th issue, dated May-June-July 1924, when the Cornelius Printing Company, to whom Weird Tales was heavily in debt, assumed virtual ownership of the magazine. One hitherto undeveloped story is the degree of early editorial involvement of Farnsworth Wright, who became to the golden age of Weird Tales in the 1930s what John W. Campbell and his pulp Astounding were to the Golden Age of Science Fiction in the 1940s. Although Wright assumed full editorship of the magazine with the November 1924 issue, after a five-month hiatus in which no new issues appeared, he had apparently been appointed in­terim editor as early as February of that year, but broke sharply with Henneberger when he saw the extent to which the magazine’s contributors had yet to be paid for their submissions. His assump­tion of editorial duties at the end of the year was actually a rehiring. Probably the most impressive thing about Locke’s book is the realization that the many ac­counts and articles that he accessed were always available. It’s just that few before him could get their hands on them, or knew where to look for them. It leaves the reader to wonder how much other buried information about Weird Tales‘ his­tory and legacy is still waiting to be uncovered.